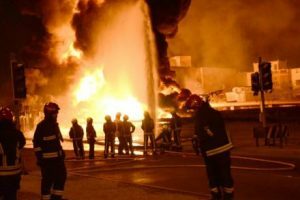 The National Oil Spill Detection and Response Agency (NOSDRA) has confirmed another pipeline blast at an oil field, operated by the Nigeria Agip Oil Company (NAOC) in Bayelsa, killing three people. The Director-General of the agency, Dr Peter Idabor, confirmed the deaths in a telephone interview with the News Agency Nigeria (NAN) on Tuesday in Yenagoa. He said, however, that a staff of the agency was lucky to escape death during the incident. A source in Olugboro Community told NAN that the dead people were maintenance workers, repairing crude oil pipelines at Olugboro in the Southern Ijaw Local Government Area of Bayelsa. The explosion, which occurred on Easter Sunday, also left several people injured. Idabor said that the survivor had drawn the attention of oil workers to the breach of safety procedure and left the scene shortly before the incident occurred. “I received a report of the incident from our staff in Yenagoa office and luckily one of our officers on the team survived. “Because of the safety conditions of the place after inspection my staff left the place and he was not affected. 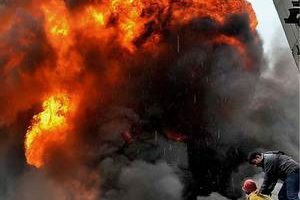 On July 9, 2015 a similar blast at Agip’s oil field in Azuzuama in Southern Ijaw left 14 people dead. A regulatory official of the Bayelsa State Ministry of Environment and NOSDRA and 12 maintenance crew members were among the victims.